John will visit schools to lead workshops or to read extracts from his books as a visiting author, and for book signings. He does not normally charge any fee for such visits if the visit is well advertised and he is given the opportunity to sell copies of his books at the end of the workshop. He will be happy to sign these books. He will sell copies of Nicola's Ghost at £6.50, A Spectre in the Stones for £7.00, Jax' House for £8.00. an Kamazu's Big Swing Band for £6.00(They can also be bought through Amazon and Waterstones, and can be ordered at any reputable bookshop.) [See How to buy for details] In addition he does an extra special offer: any two of the books for £12 and any three for £17. If a family want to buy all four books, he will let them have them for £20. Also, if schools want to purchase copies to read for suitability before inviting John in, then he will let schools have a four book set for £20+£4 postage and packing. Schools can order a set directly from John, at a saving of £11 on the rrp. Cheques made payable to W.J.Kitchen, and orders to: John Kitchen, 4, Witney Road, Ducklington, Oxon, OX29 7TZ. As John does visits for no fee it is his wish that teachers prepare children for the visits and are able to follow up the workshops in order to spur children on to enjoy reading and writing. If schools want a visit but do not want to follow up, or publicise the visit or have John sell and sign books, then he does charge a fee. His rates are £100 for a day or £60 for a morning or afternoon. John was a head teacher in Oxfordshire for eighteen years, during which time he was seconded for a year as an advisory head teacher.He visited schools, supporting heads and newly qualified teachers. During his secondment he went into several schools to talk to children specifically about writing. A study written by John was published in The Reading Environment by Aidan Chambers and a further piece written by him entitled How Children Choose Books was edited by Philip Pullman and published by Oxfordshire County Council. John also read the manuscripts of non-fiction children's books for Blackwell's Publications and for Valerie Fawcett at SYNTAgM Ltd. He reviewed newly published children's fiction for Signal Press published and edited by Nancy Chambers. John's first book won two awards. But most importantly, John is an experienced teacher, used to talking to, and interacting with children. NB. With the exception of Programme 5 below all the workshops are aimed at writing rather than reading and programme 5 approaches the subject in a rather academic way. However, John is aware that only 30% of girls and less that 25% of boys over the age of eight actually read fiction for pleasure outside school. In order to inspire children's fiction reading he is very happy to talk about reading and accompany this with readings from his books. This will give young people the opportunity to hear an author reading his own work which, he hopes, will stimulate their interest in reading and illustrate how the joys of reading stories can be, not only a pleasure, but also a not-to-be-missed opportunity to enter into other people's lives and to live in other worlds in a way that no other medium can do. At the moment fiction offers a life-enriching opportunity that over 70% of our children are missing and John feels that every opportunity should be grasped to rectify this. Programme 1 for John's Workshop. (These are all suggested programmes and are entirely flexible. John will talk about issues from the programme as appropriate to the group he is with. They are not plans, merely an indication of the kind of subjects he will discuss during the workshops. How do you set about writing a story? 1. Discuss a story's beginning - the idea. All the suggestions made by the children will be listed on a whiteboard. 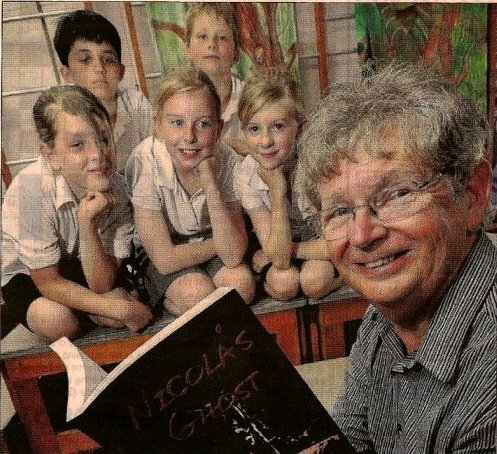 * The children will be shown artifacts, copies of a full handwritten manuscript, typescripts, galley proofs, the photos used to develop the front cover and in workshops using Nicola's Ghost they will see how a pinhole camera works and learn how to make one of their own. Discuss what makes reading a book so special. 1. Reading makes the whole experience personal - the characters, the setting, the events, the feelings of the characters come to life in the reader's head in a way they don't with any other medium. 2. The writer's responsibility to help the reader live the story. 3. Extracts from Nicola's Ghost or A Spectre in the Stones or Jax' House that illustrates how the scenes, events and experiences in the narrative are written to help readers live them in their imagination. Section 3 A Question and Answer session. (About 10 minutes). About any other related issue except ... How does the story end! John will then sign books for those children who either have or wish to buy copies. Note John encourages questions throughout his workshops, and if there is a particular learning point that the teacher wants emphasised, he is happy to adapt the workshop to accommodate this. 1. Discuss what makes reading a book special. The fact that the reader 'takes possession' of the book because readers create the image of the characters, scenes and events in their own imagination and live their experiences. Each reader's image of the book is unique to them. 2. Show how it is the duty of the writer to grab the reader's attention and help him picture the story in this by the way he writes, using words to create mood and atmosphere, images, scenes where events take place and character. 3. Illustrate 'mood settings' 'tension building' and 'scene and character creation' from Nicola's Ghost or A Spectre in the Stones or Jax' House. 4. Stress the importance of maintaining tension by tight narrative and good plotting. 5. Show how this is done by extensive and honest redrafting. High quality writing and plotting and a great deal of persistence and hard work could result in your book finding a publisher. The end result - the published book. Describe the excitement of holding your book in your hand when it is finally published. 1. Show how you tell a story through narrative, unfolding the story and maintaining a good pace. 2. Creating back-story through narrative. 3. Setting the scene and mood through narrative. 4. How does sentence length and structure vary pace and create mood. 5.Character - to show or tell? 6. Show character through dialogue - the way the character speaks - what he says, etc. 7. Using dialogue to unfold the story and move the story on. NB The above programme and programme 4 are quite challenging and are really only appropriate for KS 3 and 4. 1. Discuss the importance of refining a piece of writing. 2. Show the first draft of page one of chapter six - A Spectre in the Stones. 3. Highlight one passage and discuss reasons for changes made. 4. Look at the same passage in the final draft. Discuss the additional changes from draft one to final draft. 5. Look at further changes suggested by editors and copy editors before publication. 6. Some suggestions accepted and some rejected. Discuss why each decision was made. 7. Read the passage in its final version, from the book, and note how the changes have improved the narrative and the way the story is told. Redrafting is one of the most difficult things for a writer to do, but directing an objective critical eye at your work is essential to successful writing. 1. This workshop is designed to show and discuss the different levels in a book and how to read beyond the words. 2. A book is like a river. On the surface you have the visible action - the plot. 4. The change in the current. Discerning changes and developments of characters and what it is that changes them. Understanding the force that establishes and binds characters in friendship or animosity. 5. Reading the ebb and flow. Understanding the patterns in the structure of the book. 6. The living things lurking under the surface. There are sub-plots - stories within stories, there are spoken and unspoken challenges and movements in the story to make the reader think of deeper issues than those seen from a surface read, and to help drive a good story forward. Read to be aware of, and be challenged by, these issues and movements within the story. Issues can be detected from every level of reading and by linking the various levels. The deeper the reading the richer the experience. This workshop can be directed at young people from the more able readers in primary (year 6) to readers in the sixth form (secondary) and John will use A Spectre in the Stones or Jax' House as a text.